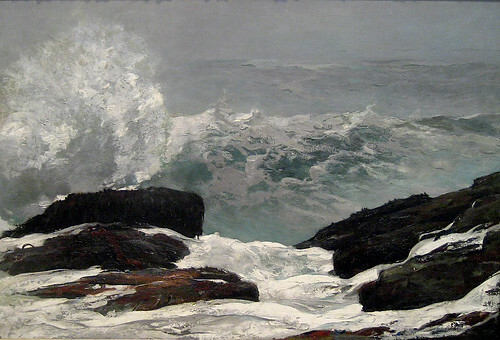 That the true spirit of art is the work of the imagination and soul of the artist, which expresses his inner thought clearly and forcefully, even though the work may not be technically correct, was the theory advanced yesterday afternoon by Howard Pyle, the well-known artist, in the Drexel Institute. And an as yet unidentified newspaper gave a much more detailed report, also on January 10, 1906, which I’ve transcribed in full, below. Although the article names a number of the pictures Pyle featured in his slideshow, I’m having difficulty identifying all of them, so if anyone can present some more viable candidates, please let me know. Howard Pyle lectured at the Drexel Institute yesterday on “The True in Art.” His chief aim was to show that the ambition of a great artist should be to portray his ideal in as vividly life-like a manner as the barriers to all artistic expression will permit. He cannot express passage of time or increase of age, the speaker said, but he can express emotion. 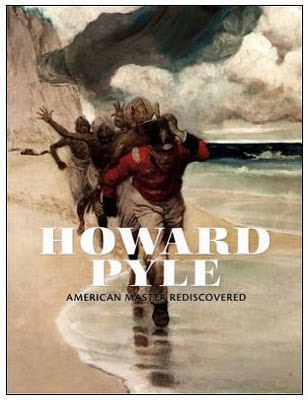 To illustrate the difference between the art of the past and that of the present, as regards the truest understanding of a picture, was another of Mr. Pyle’s objects. The main difference, he said, lies in the difference of man’s mind, which in the Middle Ages was not creative. To illustrate the speaker’s points stereopticon views were given. Four pictures representative of the art of the past, which were shown, pointed out that in the picture of the Madonna by Botticelli the Virgin is not portrayed as a Jewish maiden, but as an Italian symbolic of the perfection of womanhood. The same is true of Raphael’s Madonna, which portrays the highest form of maternal love, but only as the artist saw it among Italian women. Raphael’s “Sistine Madonna” is not necessarily THE Madonna Pyle discussed, but she’ll have to do for now. As with the Raphael, Pyle may have discussed another Madonna than the “Madonna del Magnificat” by Sandro Botticelli. A similar idea was shown in the pictures by Millet - “Procession of Joseph,” the “Ploughmen” and an effective and wonderful work entitled “Leaving England,” [sic - “The Last of England” by Ford Madox Brown ] on which the artist labored years to bring an acute sense of tragedy to the face. 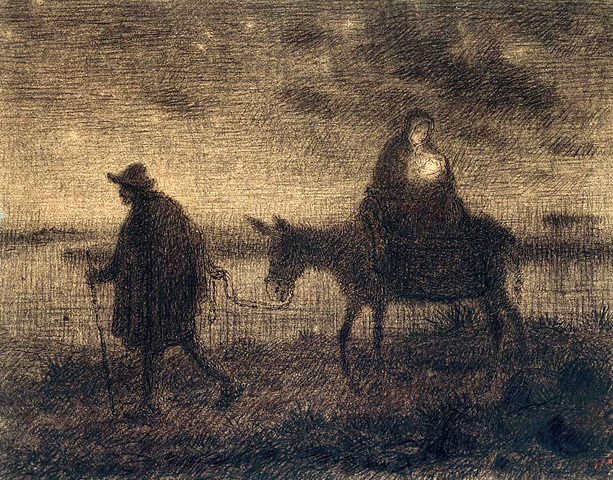 I assume “The Procession of Joseph” is really “The Flight into Egypt” by Jean François Millet. It represents Joseph carrying the Christ child - with halo aglow - followed by Mary. There is a similar version, where Mary is carrying the baby and is sitting on a donkey led by Joseph, but I believe Pyle would have been more familiar with the version show here. Millais’s “Ophelia” was another illustration used to show the extent to which the artist went to get just the right touch of a woman floating in the water. Then Mr. Pyle spoke of the American school of artists of today. Placing Augustus St. Gaudens at the head of the list, he presented a picture of the head of “Victory” used on the Sherman statue to show that this was St. Gaudens’s conception of glorified American womanhood. “Head of Victory” by Augustus Saint-Gaudens. Pyle had a slide made from a plaster study which the sculptor had given him in 1902. Shown here is a replica of the bronze version. In this way Mr. Pyle tried to illustrate his theme, that to be a great artist the aspirant must not think solely of painting and drawing well - for then he will in time make a beautiful picture, but never a great one. To paint a great picture he must have a huge ideal which he is always trying to express in its most complete form as he sees it in his dreams. Nice presentation of this article. When I originally encountered it, my first thought was how much of what Pyle was saying got lost or garbled in translation. And I wondered whether Pyle had aimed the talk more at the general audience, rather than serious students. I find Vision Antique the likelier of the two mentioned because it has a truly dreamy quality. But his Sacred Grove might also be considered because of the angels. 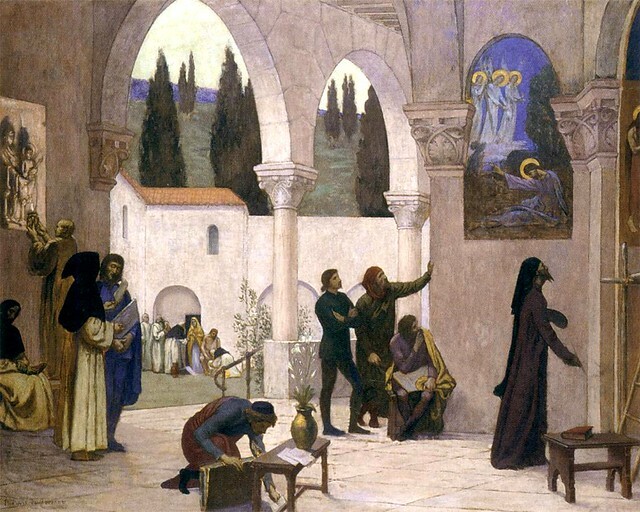 Thanks - “The True Spirit of Art” was a lecture that he’d been delivering here and there starting in Fall 1905. The venues were mixed: sometimes art-student-heavy, sometimes more “general public.” Other articles - if they surface - might tell us more (actually, I have a couple of other articles, but this was the most thorough - I also know of other pictures he discussed and I’ll stick them in another post, eventually). Now that I think about it, if only some figures are angels, it couldn't well be heaven depicted, could it? It must be angels visiting earth. So Vision Antique seems the most likely candidate again.